Cleaning a house with preschoolers? Don’t be silly! | Have kids, they said. It'll be fun, they said. Cleaning a house with preschoolers? Don’t be silly! Honestly, you would have more success standing in the middle of the room and throwing everything into the air. A few years ago BC (Before Children), Mr T and I visited a friend who had three kids, aged 6, 4 and 2. We cooed and were thoroughly entertained by these adorable children. We played, we giggled and we had a lot of fun. And then we left. Once we were in the car and on the way home, Mr T turned to me and said, “That house is a MESS. I will never, ever live in a house like that. The food on the floor, the clutter in the corners, it’s just unbearable”. And I’m ashamed to say, I agreed with him. We figuratively patted each others child-free backs and returned to our tidy 2-bedroom cottage to relax in clutter-free happiness. Fools, we were. Fools. I shake my head even as I type this. Oh, how little we knew. Because, I really think it is inevitable that with children, comes mess. Particularly preschoolers. 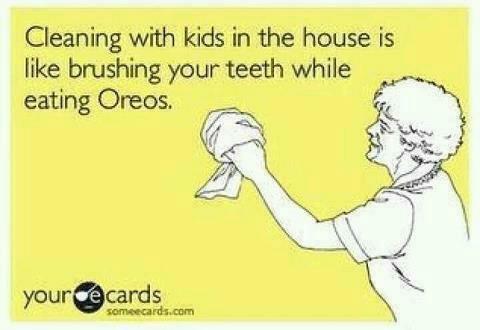 And more children = more mess. I mean, you can teach a child to tidy up after themselves but that comes with time and age. 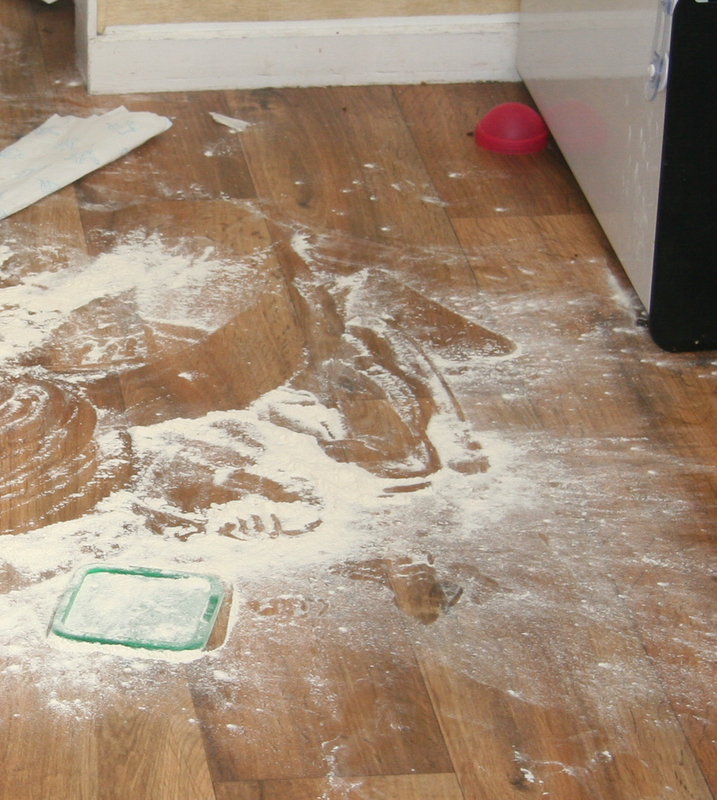 A 9 month old isn’t terribly good at remembering they should put away their blocks before tipping the entire contents of their brother’s toy cars all over the floor, no matter how many times you ask her. 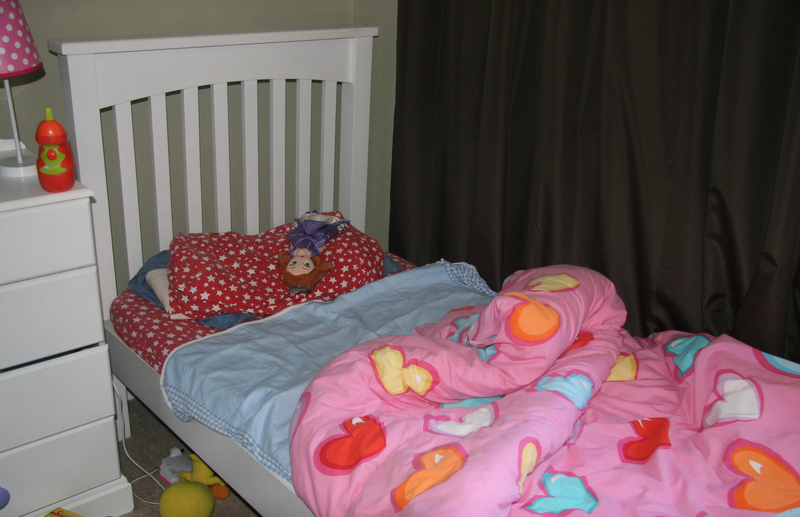 When I was pregnant with Princess, we kept our house as tidy as it always had been. Clutter-free. Baby clothes neatly placed in drawers, blankets nicely folded on shelves. Literally the day after she was born, our midwife commented with a smile about the state of our house and I remember looking around thinking, “where on earth did all of this come from?”. It came from the baby, those towels and baby clothes and nappies and dishes and toys and everything else. IT CAME FROM THE CHILDREN. And now, fast forward nearly five years and we have five individual people adding to the mess, including the three preschoolers. Bringing me to my point – housework. They say, doing housework when you have preschoolers is like doing paper work at a desk with a desk fan on full power. So true. If I had a dollar for every time I have tidied one room then left for literally 30 seconds, only to return to the same mess I just tidied, I would be a rich lady. I tidy my house. I vacuum, despite once (or thrice) vowing to never touch a vacuum cleaner. I do laundry. Six million loads a day. No exaggeration, I assure you – how a 4 year old goes through six pairs of leggings per day, I don’t know! I wash, I hang and I fold. I pick up toys and put them in their proper homes. I load and unload the dishwasher. I make all four beds each morning. 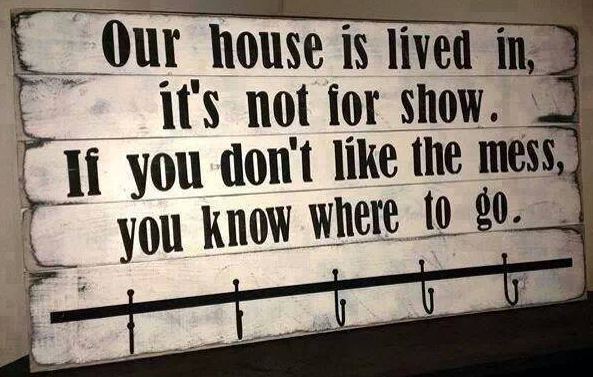 Because, realistically, my house is lived in. We live here. And as much as I don’t love the mess and the clutter (and I for SURE don’t love the toy I just stood on, rendering me speechless with silent tears momentarily), I don’t want to banish my children to one corner of the house while I dedicate my time to cleaning. I would rather spend that time with my children, playing alongside them, than worrying about cleaning around them. As long as things are relatively hygenic, I’m happy with that. I’m sure there are people out there who are able to maintain a spotless house while still raising lovely preschoolers, and I take my hat off to them. But I am not one of them. And, I figure, if anyone comes to our house and judges us for it, that is more their issue than mine. SHAME on me for judging my amazing friend all those years ago, SHAME on me for not appreciating how awesome a job they were doing (and still are) with their kids. Mr T and I recall this conversation and chalk it up as yet another Horridly Wrong Preconceived Idea on Child Rearing. We choose to surround ouselves by people who accept and love us for who we are, and I adore the fact that I can visit friends and know that their houses will be equally as untidy as ours (kudos to my friend who says, “If my husband asks, tell him I vacuumed before you came over”). Mess can be tidied up, memories can’t be re-created. These days, Mr T and I just wait until the kids are in bed then do a ten minute tidy around the house. That way, we relax for the evening in a tidy house, and it’s all fresh for new mess tomorrow. Besides, if someone important is coming over who you want to impress, you’d be amazed at how much cleaning can be achieved in half an hour!